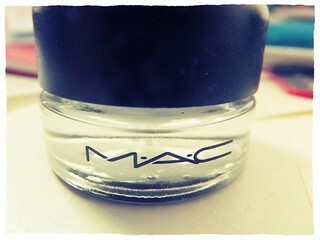 The other day, I went to apply my favourite eyeliner (Mac Fluidline), which I had foolishly left with the lid off in the hot weather. It looked very sad indeed. 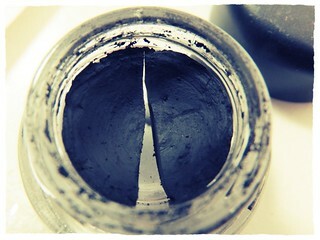 Dry, cracked clean down the middle, and there was no way I was ever going to coax any of that black goodness to come out of the pot and on to my brush, let alone stick on my eyelids. I became cross with myself for being careless and foolish. I did not want to throw away something perfectly usable, if only I could fix it. Then I became determined not to be defeated by a pot of make up, and began to hit up Google for some solutions to my problem. When I found one, I was so bemused at how it could work, I put off trying it out until the next morning. 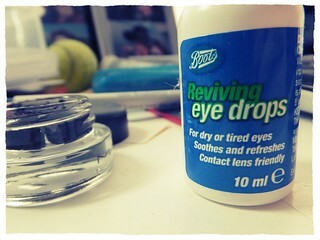 It involved eye drops, which intrigued me. I had some cheap and cheerful eye drops in a drawer, from when I used to commute to work on the underground and my eyes would get very sore and scratchy. I had First World Problems. I squeezed three drops into the dried up pot, and admittedly, I was a little disappointed that it didn’t magically fix itself immediately. The drops sort of rolled around in the crack, and nothing seemed any different. I grabbed a kirby grip (that’s a bobby pin to you guys over in the USA – hi! 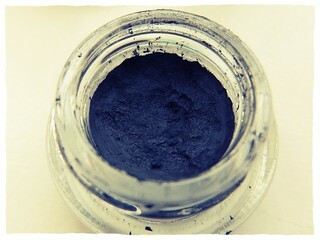 ), and started to scrape the eyeliner off the sides of the pot and stir it around with the eyedrops. At about this point, I thought I had lost my mind and should just throw it all away. “Never, never, never give up!” Winston Churchill boomed in my head. Besides, I’ve got an unpleasant tendency to give up something that I am not immediately good at, and that’s not a good way to approach life when you’re 27 years old and need to get good at something. So I forged ahead. Once I’d mixed everything together well and smoothed out the paste (and flicked some all over my white desk, hands, fingers, clothes etc), I took a cotton wool bud and started to restore some order to the little pot of horrors. I had to clean up the rim of the pot, and then clean everything around the pot with some make up remover, but I was pretty pleased with it. 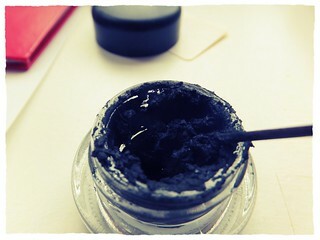 The gel itself was now the perfect consistency to apply to my eyelids, and gives a good clean, bold line. I am now obsessive about replacing the lid on the pot, even though I’m armed with this fix now. Thank you, internet. Specifically, thank you to this page for the original advice that I found. Edited 12/03/2014: Since I posted this originally, I’ve had to undertake this whole process twice, as the pot keeps drying out. I’m not that good at the whole lid-replacing thing. I also actually prefer the eyeliner with a softer consistency, and would suggest using four eye drops and making the paste a little thinner. This might prolong the time that it’s usable before it needs fixing again.